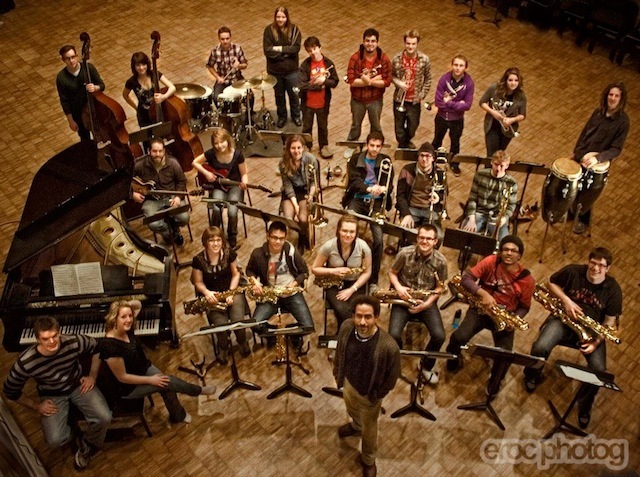 Jazz Studies at Brandon University attracts talented students from coast-to-coast in Canada, and also from around the globe. The Jazz and Contemporary Popular Music program at BU offers students a unique and comprehensive course of study leading to the Bachelor of Music degree in Jazz and Contemporary Popular Music. Our carefully designed curriculum was crafted by full time faculty members Greg Gatien (saxophone), Michael Cain (piano) and Eric Platz (drums/percussion). Through personalized instruction, we provide high-level training in a dynamic and supportive learning environment. Based on the tried and true Artist-as-Mentor tradition, students work closely with experienced faculty as they learn first hand about the language of jazz. This work blends detailed study of the music’s history, theory, and performance practices. Our diverse curriculum also includes thorough instruction in the areas of jazz improvisation, composition, arranging, and pedagogy. Emphasis is placed on small group playing as a means of exploring advanced solo and ensemble techniques. Outside the classroom, students experience numerous opportunities to perform, record, rehearse, and study privately. This year, seven small jazz groups and two large jazz ensembles give frequent performances at Brandon University and at off-campus locations. The small groups play weekly at a downtown café. The school of music is particularly proud to have pianist Michael Cain as an Associate Professor on faculty, teaching jazz piano, improvisation, composition, electronic music, and directs the top jazz big band. Mr. Cain is an international recording and performing artist who began a performing career in Los Angeles while a student at the California Institute of the Arts (CalArts) working with flutist and composer James Newton, jazz vocalist Marlena Shaw, The Gerald Wilson Orchestra, and drummer Billy Higgins among others. After moving to New York in 1990, Mr. Cain became a first call pianist and keyboardist performing and recording with a variety of celebrated jazz musicians, perhaps most notably with Jack DeJohnette for a nine year period. Other musicians Michael has worked with include Dave Holland, Greg Osby, Robin Eubanks, Christian McBride, Steps Ahead, Joshua Redman, Ravi Coltrane, Bobby McFerrin, Stanley Turrentine, Pat Metheny, and Meshell N’degeocello. He has received numerous awards, including a 2006 Grammy nomination for Dance of the Infidel, Meshell N’degeocello’s release on which Michael is pianist and co-arranger. He has recorded several records as a leader including Circa, a 1996 ECM release, and served as producer for several recordings including Ron Blake’s Shariya, and Brian Landrus’ Traverse and Capsule. Other notable projects have included serving as musical director for the José Limón Dance Company, writing the musical score for the films Maybe and Real With Me, by director Carl Ford for Black Nexxus Films, and composing the music for the Broadway play View from 151st Street, a LAByrinth Theater Company production which ran at the George Papp Public Theater in New York City in the fall of 2007. Mr. Cain has been an Assistant Professor at The Eastman School of Music in Rochester, New York, and the New England Conservatory in Boston, Massachusetts, before coming to Brandon University in 2008. Every year the BU School of Music hosts several concerts, workshops, and master classes given by distinguished visiting artists. For the last two years the jazz department is happy to have renowned jazz trombonist Robin Eubanks as a regular visiting artist working with our students via Skype. Mr. Eubanks is the premiere jazz trombonist of his generation. He has a performing career that has yielded an amazing array of collaborations with such notable artists as Art Blakey, Elvin Jones, Eddie Palmieri, Sun Ra, Barbra Streisand, The Rolling Stones and Talking Heads –just to name a few. He’s won Grammys for his performances on Michael Brecker’s Wide Angles and Dave Holland’s What Goes Around. Brandon University also hosts The Brandon Jazz Festival, which is an annual event that energizes our city and attracts thousands of fans and participants from all over North America. For more information contact the School of Music or visit us during our annual open house. BU School of Music is proud to possess “The Jill Hodson Memorial Jazz Collection”, which was donated in order to augment the resources available to School of Music students enrolled in coursework or ensembles in the area of jazz studies. Comprised of recordings, history books, general interest books, videos, and periodicals, this collection contains materials that will be of interest and benefit to a range of people, from the serious jazz musician to the interested lay person. Donated by Mr. Dave Hodson in loving memory of his daughter, this collection is currently housed in room 1-33 in the Queen Elizabeth II School of Music. Arrangements can be made to view the collection and borrow materials by contacting Professor Greg Gatien (gatieng@brandonu.ca). Eligible students may borrow up to three items for a period of one week.